FLINT, Mich. — Hillary Clinton joined Bernie Sanders in calling for Michigan’s Republican governor to resign over his handling of the Flint water crisis as the Democrats opened their seventh presidential debate Sunday in a city that was in tough shape even before residents learned their drinking water was tainted. The Democratic candidates faced off in devastated Flint just two days before Michigan’s presidential primary, eager to highlight their differences on economic policy, Clinton claiming only she had a “credible strategy” for raising wages and Sanders hammering at her past support for trade deals that he says had “disastrous” consequences for American workers. An emotional Sanders opened the debate by relating that he felt “literally shattered” by the water crisis in Flint and renewed his call for Gov. Rick Snyder to resign. On economic policy, In recent days, Clinton emphasized her plan for a “clawback” of tax benefits for companies that ship jobs overseas, using the money to encourage investment in the United States. Sanders wrote in Sunday’s Detroit Free Press that nowhere are his differences with Clinton, a former secretary of state and senator, stronger than on trade. The Vermont senator renewed his criticism of her support for the North American Free Trade Agreement and normalized trade relations with China. With Clinton continuing to widen her considerable lead in the Democratic delegate count, Sanders sees upcoming Midwestern primaries as a crucial opportunity to slow her momentum by highlighting his trade policies. After Michigan’s vote on Tuesday, the March 15 primaries include Ohio, Illinois and Missouri. The state’s unemployment rate has fallen to 5.1 percent, its lowest mark in more than a decade, but is still slightly higher than the national average of 4.9 percent. Sanders, interviewed Sunday on CNN’s “State of the Union,” pledged to keep his campaign going to the Democratic convention this summer even if Clinton already has clinched enough delegates to claim the nomination. “Every state has the right to vote for the candidate of their choice,” he said. Clinton has at least 1,123 delegates to Sanders’ 484, including superdelegates – members of Congress, governors and party officials who can support the candidate of their choice. It takes 2,383 delegates to win the nomination. Just as the debate got underway, Sanders received the welcome news that he had won the Democratic caucuses in Maine, not far from his home state of Vermont. That gives him victories in eight states to 11 wins for Clinton. But the more lopsided delegate count suggests Clinton is on a steady march toward the nomination. Sanders has struggled to broaden his appeal beyond the liberals and young voters attracted to his campaign. The candidates devoted considerable time to the water crisis in Flint, which got scant attention from Republican candidates when they debated last week in Detroit. Both Democrats have been outspoken about the horror of the city’s lead-tainted water. Both have visited the city and called for a strong government response. The city’s water became tainted when officials switched its supply from Detroit’s system to the Flint River in 2014 to save money. The impoverished city’s government was under state control at the time. Even before the water problem was revealed, the city faced considerable challenges. Some 42 percent of residents live in poverty, according to census data, and across the city, the average per capita income is just $14,527. Associated Press reporters Catherine Lucey and Nancy Benac wrote this report. 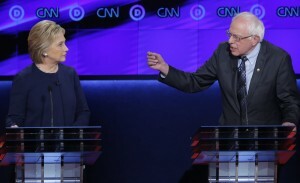 Left: Democratic U.S. presidential candidate Hillary Clinton listens as rival and U.S. Senator Bernie Sanders speaks at the Democratic U.S. presidential candidates' debate in Flint, Michigan, March 6, 2016. Photo by Jim Young/Reuters.